A POS or Point of Sale system is essentially a system that mixes and eases up the payment processes of a retail store. It is made up of a software that is usually used for recording all of the details of each sale as it occurs, all the while updating the inventory records while providing customer management features that enable easy operation of your store. It further generates reports for you so that easy analysis of the sales data is made possible. The hardware of a POS may also consist of a bar code scanner, cash drawer, receipt printer, order puncher, and other such peripheral equipment based on your own particular needs. Point of Sale in retail has seen a lot of innovations over the years but now, with the rapidly changing technology, we have witnessed some very innovative POS systems. The innovation has brought more ease and comfort for both customers and retail shop owners, with paying just by your face via PayPal or generating e-receipts. Retail business owners are demanding more unique innovations in order to stand out from the rest. 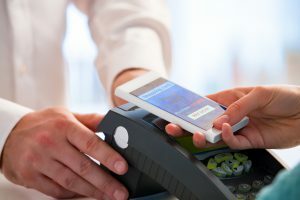 Some of the innovations that we might see around in the POS systems in 2018 are discussed below. Point of Sale Systems have revolutionized retail businesses. Imagine a store where you arrive, walk around in the aisles, look for your required item, pick it up and walk out of the store with it. It is possible as an innovative POS automatically generates payments the minute you walk out the door. There would be no physical POS system and no requirements to scan codes. Originally brought forward by Amazon, this innovative POS system is now making its way into mainstream retail businesses. The new POS system makes use of sensors and artificial intelligence to make the payments by a customer’s virtual cart where the customer is charged for the products. Order and pay on the move the next time you head out to eat or grab coffee. Make use of the interactive apps on your phone that also act as an innovative POS system allowing you to not only order your food but pay for it as you go. You can enjoy your meal and leave quickly during your busy lunch hours. This innovation was introduced by a UK based coffee shop. It simply quickens your procedure and cuts your mealtime, allowing you ease and comfort while providing business owners a hustle free counter. The same Point of Sale system is being followed by a shoe shop in the UK as well, allowing you to buy a selected product by simply scanning the code on your product while making your payment automatically. Innovative POS Systems are also helping to enhance the customer experience by not having to go to every retail store. The products are simply kept on display, where a giant tablet is also provided in the window, allowing customers to go through the latest collection of clothing of their favorite brand. The customer would have access to designs, colors, and a whole variety of choices on their fingertips without wasting their time going through stacks and rows of clothing. The same tablet could then be used to place your order and pay for it, too. This POS is gaining quick popularity in the US. A hotel in Birmingham has come forward with a unique innovation in Point of Sales where all customer just have to smile as they check out. It triggers a picture that is matched to your profile picture on PayPal, allowing you to make payments on the go without having to go through any hassle of waiting in line. Once the payment is made, an e-receipt is generated. POS Systems are revolutionizing the way customers experience shopping. As newer POS systems are created, the customer experience is enhanced, providing both the business and customers numerous benefits.